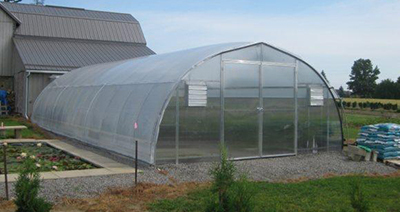 The OMNI COLD FRAME greenhouse is an economical solution to your greenhouse and shelter needs. 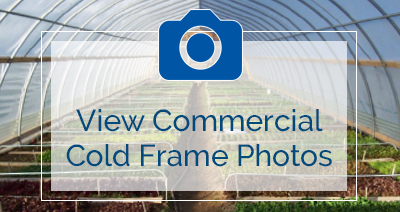 The multi purpose cold frame provides shelter for year round growing, overwintering of crops or general storage for hay, farm equipment, cars, trucks, boats etc. 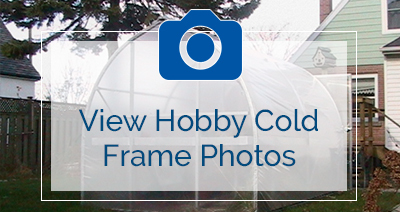 Omni cold frame greenhouses are designed to be quickly and easily assembled by the purchaser. Features such as pre-drilled holes, slip fit arch connections and Omni’s unique track mounted poly-saver ridge system which is standard on all structures, simplifies construction while ensuring consistency in strength and durability. Framing is manufactured of heavy 16 gauge x 1.5″ rd. galvanized tubing. Arches are pre-drilled for quick and easy purlin installation. 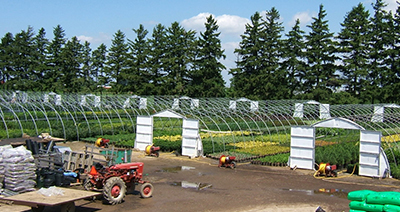 Arch spacing is every 4 feet for the 12, 14, 16, and 20 ft. wide structures and 6 ft. spacing for the 8ft. and 10ft wide structures. Gothic peak profile provides maximum headroom while reducing the chance of snow building up at the peak of the structure. Omni’s unique poly-saver ridge system eliminates poly wear at the peak where poly film is stressed the most and is standard on all models. Wind bracing of 1″ round galvanized tubing is provided for each corner. Doors are manufactured of corrosion resistant aluminum and cladded with 8mm thick twinwall polycarbonate thermal panels. Panels are durable, impact resistant and have been UV light stabilized for maximum protection against the suns harmful rays. Structures are secured into grade using standard anchor post foundation (or optional flat bottom mounting brackets for anchoring to base rails or concrete pads). Exhaust fans and gravity or motorized intake louvres for ventilation are also available. 10mm clear or white reinforced polyethylene film, durable 3-ply laminate with high strength cord grid, UV protected, 7 year rating. Rigid 8mm twinwall polycarbonate panels, clear, UV protected, high impact resistance, 83% light transmission, 10 year rating from manufacturer rigid 8mm twinwall XL panels, translucent, UV protected on both sides of panel with 77% light transmission, 10 year rating from manufacturer. Omni’s unique poly-saver ridge system allows you to obtain the maximum life from your poly coverings by producing a smooth ridge line that eliminates arch wear at the peak of the structure where poly is stressed the most. Heavy 16 gauge x 1.5″ rd. arches manufactured of all galvanized tubing deliver superior strength combined with the best corrosion protection possible. Arches are swaged for quick and easy slip fit assembly. Flat bottom mounting brackets are available upon request for anchoring the arches to wooden base rails (wood not supplied) or concrete pads. Anchor posts supplied for every arch provide a secure anchoring of the frame directly to grade. Slip fit arch connections also allow for easier assembly or dismantling for seasonal storage if desired. Door frames are made of corrosion resistant aluminum and are cladded with clear, impact resistant 8mm twinwall polycarbonate thermal panels. Wirelock poly fastener track locks single or multiple layers of poly film or shade fabric securely to the frame simply by inserting the 4′ stainless steel wire inserts into the aluminum base track. Baseboard mounting clamps are supplied for securing to wood baseboards (wood not supplied) which in turn supports the wirelock poly fastening track. Gable arches are available with wirelock poly fastener track and EPDM rubber closure. This UV protected rubber closure provides an excellent seal over the exposed edge of various end wall claddings up to 1″ in thickness. Gable End Wall framing is available for all models. Framing members are 1.5″ sq. galvanized tubing that has been pre-cut to the required lengths. Aluminum baseboards provide a secure and convenient means of fastening single or multi layers of poly film coverings. Bolt track on back face allows for convenient and independent mounting. The 12′ length extrusion includes wirelock poly fastener track and (3) 4′ stainless steel wires. Pricing for 2017 product line to be announced. Click here to request a quote.